Are you sitting hunched over an office desk all day, staring at documents or talking on the phone? Human Beings just aren’t made for it. Physically; it’s uncomfortable. Mentally; it’s draining. That’s why when you look at work performance the original fixed height desk can only be called inefficient. But there is a solution! The revolutionary adjustable height desk, otherwise known as the sit-stand workstation, can not only promote movement but also produce a flexible and productive atmosphere. 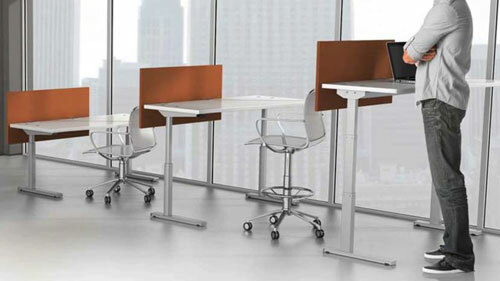 Adjustable height desks are available in just as many options as other office desks can come in. From individual workstations to connected community spaces, it’s simple to provide employees with effective, versatile and comfortable spaces. Whether you favour traditional looking wooden tops or modern contemporary designs, there are plenty of options to match the style of your office. The contemporary Ergo Workstation 30, 50 and 70 systems can all collaborate with the Strata range of height adjustable desks. The Strata workstation range can also be manipulated into an existing screen layout. In a recent study conducted by Cornell University; computer workers reported a substantial lessening in musculoskeletal pain and discomfort after using some adjustable desks after only 4-6 weeks, and four out of five participants preferred standing workstations to stationary alternatives. Also, many studies reveal that traditional office chairs and desks result in blood pooling in the thighs and quadriceps, leading to poor circulation and aching muscles. In providing the option to standing up or even to adjust the height of workstations, the improvement in work performance, increase of overall alertness and reduction of common health issues that plague other offices, is truly amazing. To achieve maximum benefit from your height adjustable workstations, encourage employees to sit and stand alternatively every few hours. Some people however will be unable to stand for long periods of time while others tend to work best on their feet. Employees benefit from the maximum comfort and versatility by merely being able to adjust a monitor a few inches to help relax their necks, or the opportunity to convert to a standing desk by fully extending the legs. But most importantly the adjustable height workstation offers flexibility and multiple possibilities to break the monotony of the characteristic office environment.